President Donald Trump’s administration has quietly started cutting scores of Pakistani officers from coveted training and educational programs that have been a hallmark of bilateral military relations for more than a decade, U.S. officials say. 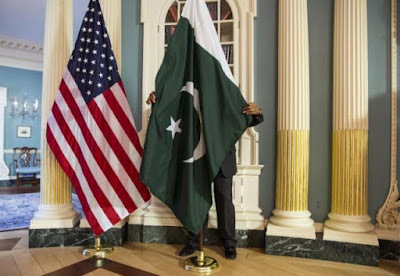 The Pentagon and the Pakistani military did not comment directly on the decision or the internal deliberations, but officials from both countries privately criticized the move. U.S. officials, speaking to Reuters on the condition of anonymity, said they were worried the decision could undermine a key trust-building measure. Pakistani officials warned it could push their military to further look to China or Russia for leadership training. The State Department spokesperson, speaking on the condition of anonymity, said the IMET cancellations were valued at $2.41 million so far. At least two other programs have also been affected, the spokesperson said. It is unclear precisely what level of military cooperation still continues outside the IMET program, beyond the top level contacts between U.S. and Pakistani military leaders. The U.S. military has traditionally sought to shield such educational programs from political tensions, arguing that the ties built by bringing foreign military officers to the United States pay long-term dividends. The War College, the U.S. Army’s premier school for foreign officers, says it has hosted 37 participants from Pakistan over the past several decades. It will have no Pakistani students in the upcoming academic year, a spokeswoman said. Pakistan has also been removed from programs at the U.S. Naval War College, Naval Staff College and courses including cyber security studies. Washington announced plans in January to suspend up to roughly $2 billion in U.S. security assistance to Pakistan. “I am shocked... We worked so hard for this to be the one thing that got saved,” said a former U.S. defense official, who was involved in the conversations. The Pentagon declined to comment on internal government discussions, but Dana White, a Pentagon spokeswoman, said Mattis long believed in the value of the IMET program as a way to build relations between foreign militaries. Feldman said that after the raid, when relations were at a low point, the United States limited large security assistance items, but made active efforts to continue the IMET program. Mattis, in private discussions within the government, had warned that excluding Pakistani officers from IMET courses could contribute to a similar situation in years to come, the former U.S. defense official said.